Augmented and virtual reality have the ability to transform the way we experience the world – but what is the difference between these emerging technologies? Augmented reality (AR) blurs the boundaries between the real and virtual world, by taking the existing environment and adding virtual objects to it. This means that you could be sitting in your living room, watching dragons soar around the space. 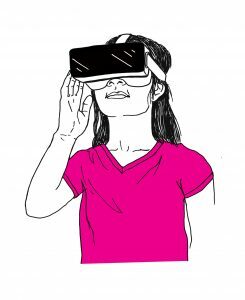 Virtual reality (VR), on the other hand, immerses users in an entirely virtual world. Once you have placed a VR headset on, what your eyes can see is replaced with something completely different. The VR world blocks out the room that you are sitting in and transports you to another world entirely. This enables to you to transported to the remotest jungle, or to the depths of space – all from your living room! The immersive impact of VR is quite dramatic. All of the reference points of the room are removed, which can become disorientating and confusing for the user. This means there are ethical considerations to take into account when using VR with people with certain disabilities. Look out for our next blog which will explore this topic further.